Barry Bonds is one of the most controversial figures in modern sports. The former major league star holds the record for career home runs (762) but that record and his other accomplishments on the field have been marred by accusations that he took performance enhancing drugs. Barry Lamar Bonds was born in Riverside, California on July 24, 1964 but grew up in San Mateo, California where he attended Junipero Serra High school. He was honored as a prep All-American there for baseball. His father, Bobby Bonds, also a major league All-Star, inspired Barry to become a professional baseball player. 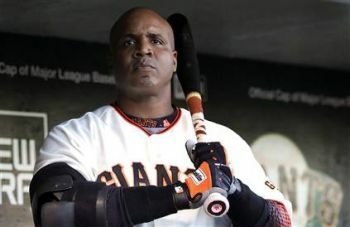 In 1982 Barry Bonds was drafted by the San Francisco Giants in the second round of the major league baseball (MLB) draft while he was still in high school. When contract negotiations failed Bonds attended Arizona State University on a baseball scholarship. He was quickly named a College All-American and set a NCAA record of seven consecutive hits in the College World Series as a sophomore. Bonds graduated in 1986 with a degree in criminology. Bonds was drafted by the Pittsburgh Pirates in the first round (6th overall) of the 1985 MLB draft. From 1986 to 1992, Barry Bonds was a Pittsburgh Pirate where he won multiple awards including his first most valuable player (MVP) award in 1990. A salary dispute forced Bonds out of Pittsburgh to San Francisco where he played for the Giants from 1993 until his retirement in 2007. Most of his record setting achievements occurred while he played for the Giants. The most important was the homerun record which he broke on August 7, 2007 against the Washington Nationals. That distinction was Major League Baseball’s most significant moment since Henry Aaron, in 1974, broke the earlier record set by Babe Ruth in 1921.Bonds also set a single season record of 73 home runs in 2001. He holds the record for Baseball’s Most Valuable Player, winning that award seven times. Barry Bonds has been a key component in the Bay Area Laboratory Co-operative (BALCO) scandal since 2003. He is under investigation for a charge of perjury and obstruction of justice for allegedly lying to the jury about the case. Bonds’s trainer worked for BALCO and admitted to giving many athletes performance enhancing drugs which is illegal in baseball. Bonds denied any use of such drugs. He was indicted on charges of perjury and obstruction of justice for allegedly lying to the grand jury on the investigation of BALCO. His trial began on March 21, 2011. Today Bonds lives in Los Altos Hills, California and is currently single. He has two children, Nikolai and Shikari. Bonds is twice divorced. His first wife and the mother of his children is Margreth Branco. His second wife is Liz Watson. He has a younger brother, Bobby Jr., who was also a professional baseball player.